Apple SVP of Internet Software and Services Eddy Cue reveals "iOS in the Car" partners at WWDC 2013. Sources tell the Financial Times that Apple will launch an "in-car operating system" at next week's Geneva Motor Show, with Ferrari, Volvo and Mercedes-Benz named as the initiative's first partners. The publication fails to name the rumored operating system, but additional details point to Apple's "iOS in the Car" program, which is mentioned at the end of the article as being introduced last year. A description of the rumored system matches exactly with iOS in the Car functionality. Specifically, the report claims drivers will be granted access to Apple Maps, music, videos, Siri, voice calls, text dictation and more via the partners' infotainment systems. 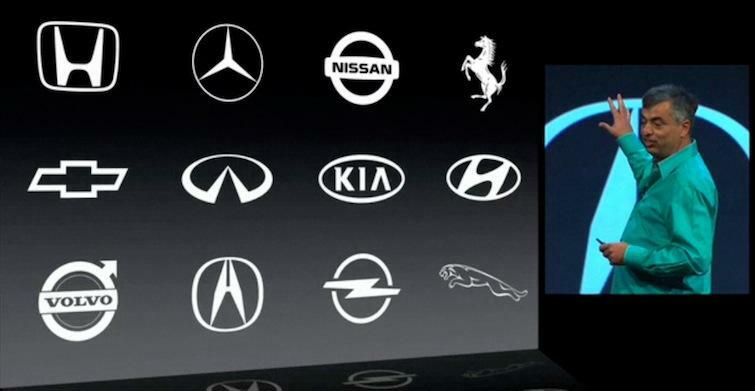 Further, as seen above, Ferrari, Volvo and Mercedes-Benz were announced as launch partners when Apple introduced the platform at WWDC 2013. Apple previously partnered with the three auto manufacturers, as well as Nissan and Alfa Romeo, in a 2005 push to integrate the iPod into car stereo systems. After its unveiling, Apple's new automotive initiative has remained largely under the radar. Select manufacturers have implemented Siri Eyes Free technology into their cars, but none have gone so far as to incorporate iOS in the Car's full suite of features. A report in January suggested Apple executives were having trouble getting the project ready for market, which could explain the nearly year-long period of silence. Most recently, a short video published to the Web in January shows what looks to be an iOS developer tool running an iOS 7.1 emulator piping Apple Maps to a simulated iOS in the Car screen.